There's also a new Visitor Center in the area of Old Failthful and it's quite a contrast to Old Faithful Inn. 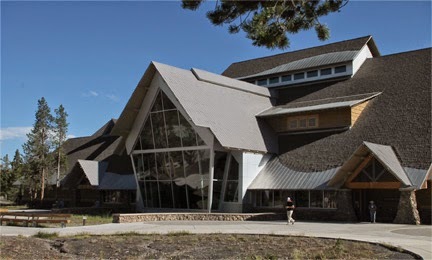 While the Inn is very rustic and traditional, the visitor center is sleek and modern. I like both but would have preferred something that more closely matched the Inn. They didn't ask my opinion while it was in the design stage so we'll go with what we got. There's something to be said for a representation of different time periods. I'm mostly grateful that the park is set aside for the enjoyment of all.